Internet Exercise 2: Meteorites in Antarctica! Homework Exercise: Meteorites in Antarctica! The existing collection of meteorites has vastly increased due to the discovery of numerous meteorites in Antarctica. We've talked about the "hows" and "why's" of meteorite occurrences in the Antarctic in class. Now I want you to use the Internet to examine the "where?" and "how many" questions. to do some of this, but do surf around and look for more sites. If you hit any sites that are not at JSC, please include the web addresses in your answers. 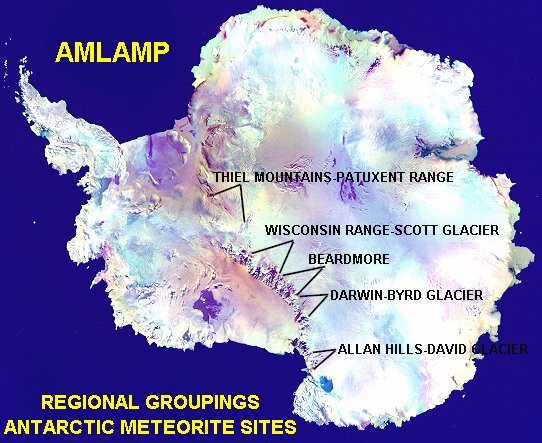 1) Where are the major Antarctic sites from which meteorites have been recovered? List them, please. 3) Which site has been studied the longest (i.e., to where have they made the most annual collecting trips)? Which is the newest site to be studied, and when was it first examined? 4) Which site has been the most productive in terms of meteorite samples collected? 5) OK, now about the meteorites: what kind of meteorite is most commonly found in Antarctica? 6) Most meteorites are believed to originate in the Asteroid Belt. Is that true of all the Antarctic meteorites? If not, which other places in the Solar system (or beyond) did they come from (and how do we know that)? 7) Which meteorites have most recently been found in Antarctica (i.e., when was the last collecting trip that is recorded here, and what did they find)? 8) Are there other places on the Earth, that, like Antarctica, have been very fertile collecting sites for meteorites? If so, where are they, and what or how many meteorites have been found? Use links in the ANLAMP site and/or the Net Search option, and see what you can dig up about such places.